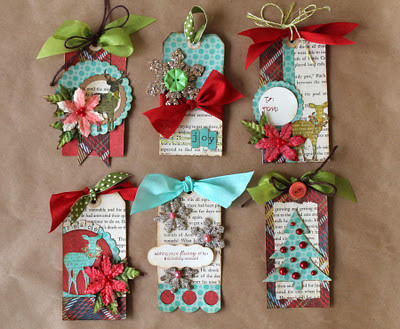 I used Avery Manila tags as my base for all of them-covering them with a mix of book paper, patterned papers and solids. I also spent some time fussy cutting the deer out of the patterned papers...I love the images so I cut several...and then only used three. So I have more to use if I want to expand this set. I used papers from Basic Grey and We R Memory Keepers. 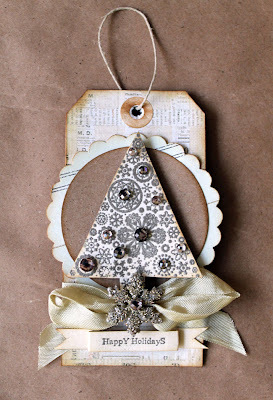 I used the Accu Cut machine from my LSS to cut some snowflakes and a darling little tree. They were cut from scrap chipboard. The flowers are all Prima as well as the leaves, along with the tiny type alphabet and red/clear crystals. All of the paper and tag edges were inked with Vintage photo Distress ink to tone down the bright colors...just a bit. 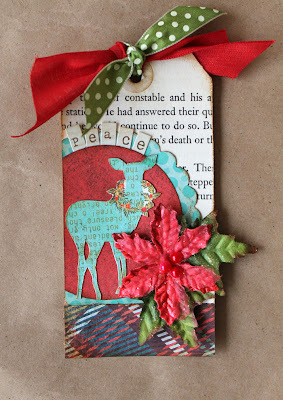 I covered this tag entirely with book paper, then added a punched edge to the bottom backed by a strip of red paper. The snowflakes were covered with glitter glass-a mix of silver and gold together-then topped with Wheatfields Glimmer mist to make the glitter look aged. The sentiment is from A Muse and it was pop dotted onto the front. 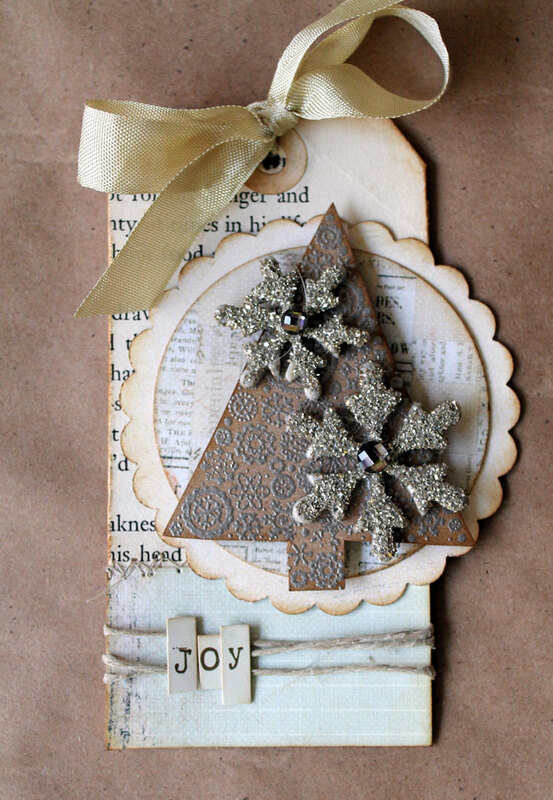 I covered this guy with patterned paper, added a bit of book paper to the center and added my chipboard tree. Then I added the bling as ornaments and tied twine with ribbon at the top. Finished off with a cute little button. So easy! I covered the tag with solid paper and added a banner down the center. I punched more circles and layered different sizes together. Then I placed my deer off to the right and finished with flowers. Thank you for stopping by...I appreciate it and I hope you enjoyed tag segment -part two. 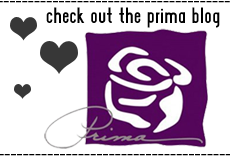 I shall return with more projects and the Live with Prima Tag class info. I just got back from my trip to Australia and New Zealand! It was an amazing experience and I plan to share lots of photos with you as soon as I get them downloaded. My computer crashed while I was away and now everything is being transferred to our other computer. 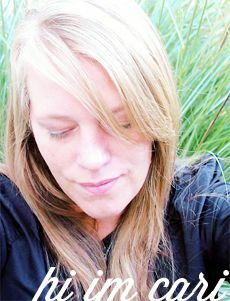 So once I get everything settled-I will download and share. Tag 2: I covered the tag with patterned paper, added another strip to look like ribbon, then stamped and embossed little snowflakes randomly over the papers. I wrapped twine around it length wise, dotted around the snowflakes with Prima bling and added a small sentiment at the bottom. I added a punched circle over the twine, decorated it with a poinsettia, leaves and a glitttered snowflake....finish off with black seam binding at the top. 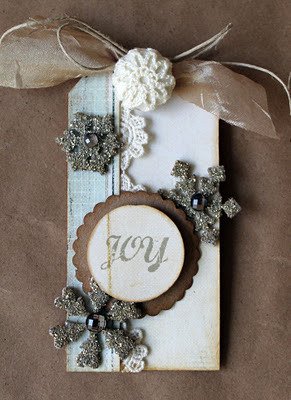 Tag 3: Cover the tag with patterned paper and another paper strip down the side, with Prima lace. Stamp and emboss joy from the stamp set and add to punched circle layers-use foam tape to pop them up. Sprinkle with glittered snowflakes and add a Cute As A Button at the top with twine and ribbon. Add bling to the snowflake centers to finish them off. 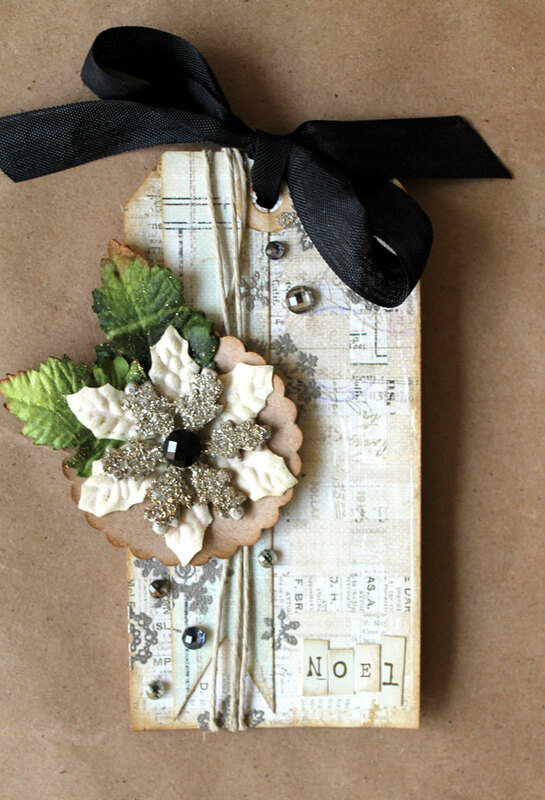 Tag 4: Cover the tag with old book paper, add lace at the bottom and tie twine with ribbon at the top. I stamped the sentiment in the smallest circle, embossed and layered with multiple circles I punched from various cardstock and papers. 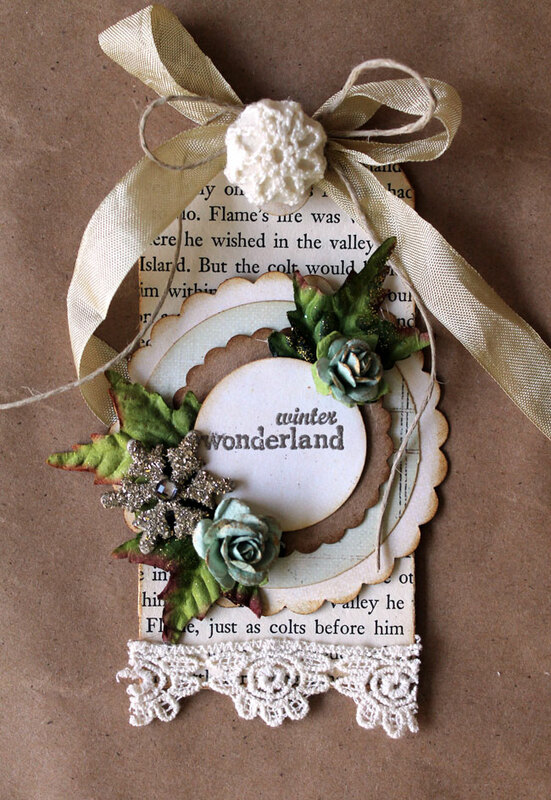 Add small roses around the circles with a snowflake and leaves. Then finish off with the button at the top. 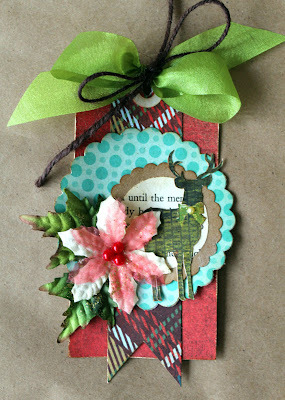 Tag 5: Cover the tag with Printery paper and tie a fat ribbon around it lengthwise. 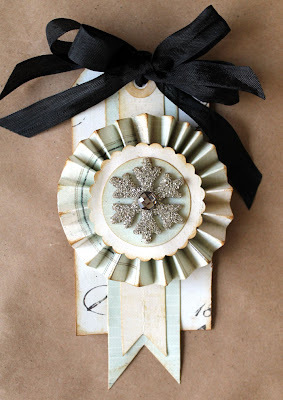 Tie some twine around the ribbon knot and adhere the circles over the ribbon. Add a Prima puffball flower to the circle with a snowflake in the center and some leaves.....easy! Tag 6: Cover the tag with paper and add a strip of another pattern along the bottom. 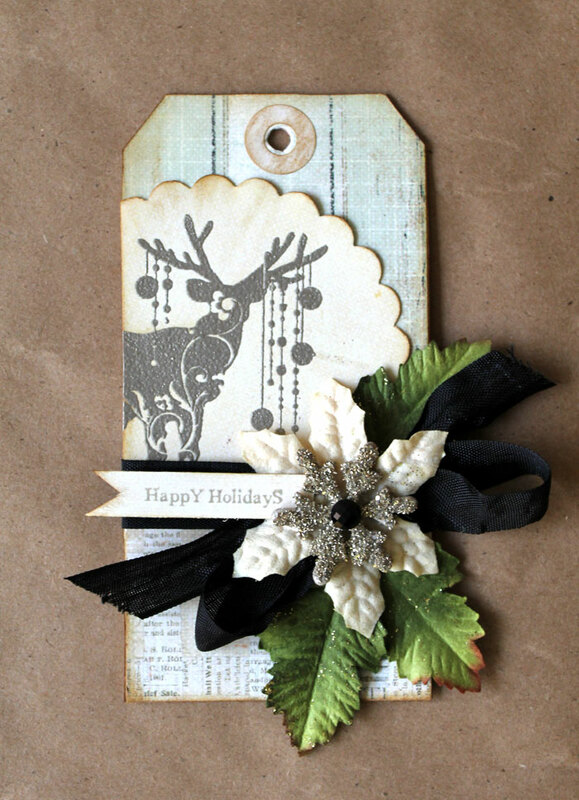 Stamp the deer onto paper, emboss and punch out. I placed the circle off the side of the tag and trimmed off the overhang. Tie a piece of black seam binding around the tag and add flower with snowflake over the bow. 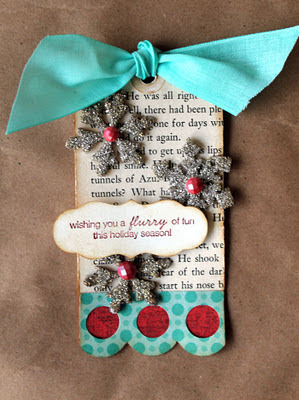 I stamped a small senitment onto the cardstock strip and tucked it in around the bow. 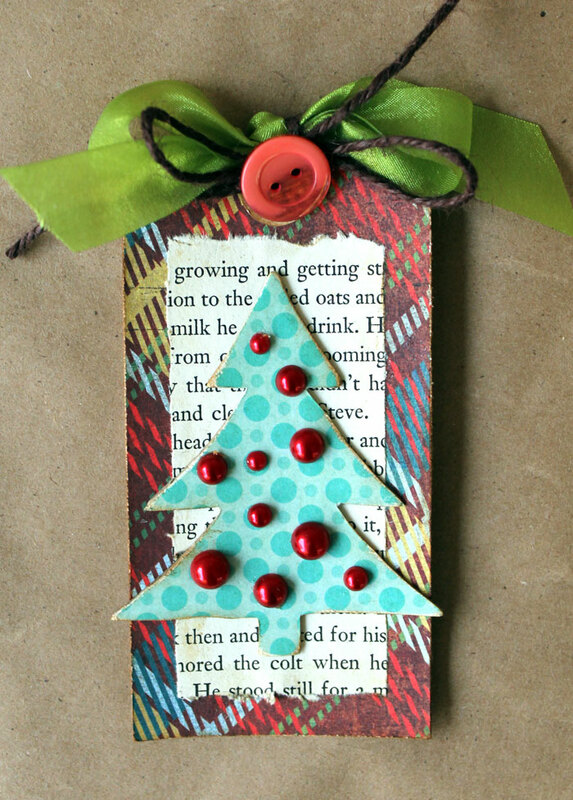 Tag 8: Cover the tag with patterned paper and add layers of punched circles to the center of the tag. 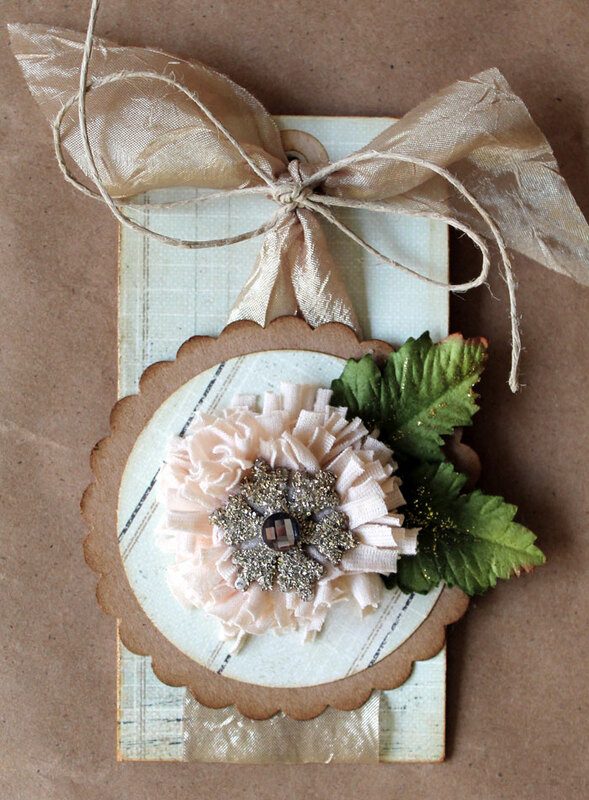 Stamp, emboss and cut out a tree to place in the center of the circles. I sprinkled some bling on the tree for extra sparkle. 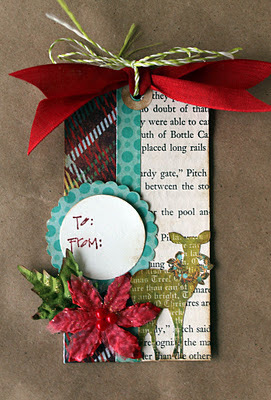 Tie a bow below the tree with seam binding and add a snowflake to the bow center. Then stamp a sentiment on a paper strip, create a banner and place just below the ribbon. 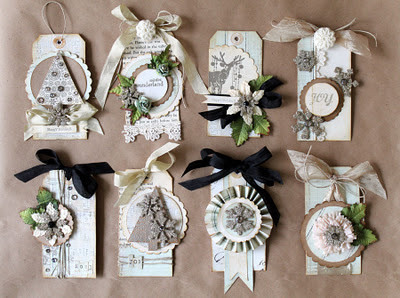 These tags were so fun to create! 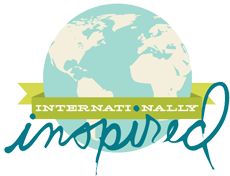 I hope they inspire you to create some of your own for the upcoming holidays. I plan to wrap some gifts in plain kraft postal paper and add these to embellish the gifts with silver and gold ribbon....maybe-hehe....if i can part with them. Thanks for stopping by and check back for more updates soon! 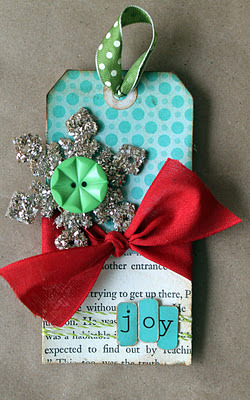 I have another set of tags to share that are brighter with lots of color....coming soon!